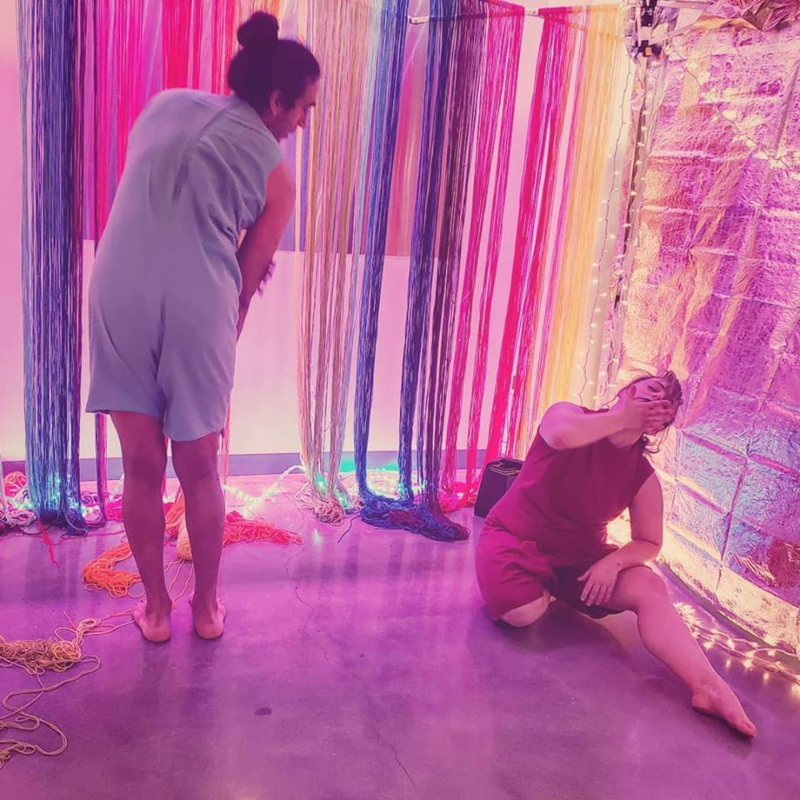 In the vestibule of Matchbox 2 at Midtown Art & Theater Center Houston (MATCH), Pilot Dance Project dancers Adam Castaneda and Shanon Adame engage in a coy kinetic conversation under a tent of crunchy gold fabric. Over a soundtrack of twinkly tunes, they slink playfully through its backdrop of colorful string arranged in a rainbow array, play a game of copycat and then peekaboo around members of the waiting audience. 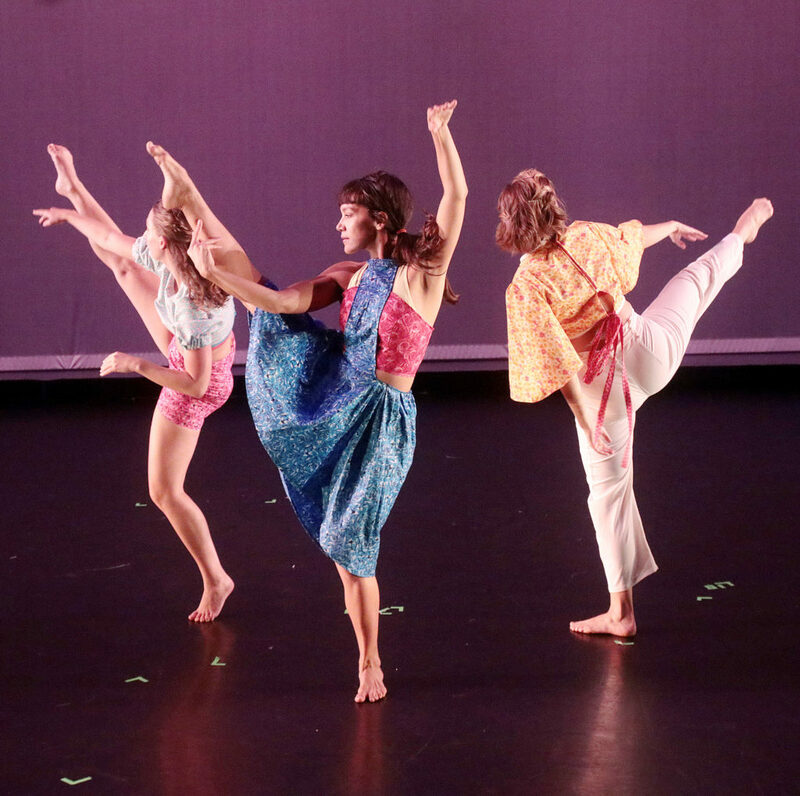 This is the prologue to Ashley Horn’s “The Sky Was Wild with Sunshine,” a continuation of Pilot Dance Project’s 2018 season of full-evening works by independent choreographers and the kickoff performance for Houston Fringe Festival’s second and final weekend. The improvised duet does feel like a sweet and welcome bit of sunshine. Once inside the theatre, however, the atmosphere grows darker with figures that loom large as shadows cast by handheld lights on a stark stage. A meditative quartet of women in apron-like smocks highlight Horn’s penchant for detailed and delicate gesture. This aspect of her work is a glittering thread throughout the hour-long performance. The ensemble of nine dancers includes the aforementioned Adame and Castaneda, as well as Angela Cohen, Lindsay Cortiner, Cloe Leppard, Holly Moran, Amy Phillips, Kristina Prats and Emily Sayre. They work confidently, blending well as a full company and throughout a series of solos, duets and small groups. I appreciate the seamless performances and yet I find myself longing to share a moment with these capable performers that snatches my breath or squeezes at my heart or guts. often the only light in the space. Permitted or otherwise, I am occasionally distracted by members of the audience making cell phone recordings of the performance. For a few seconds, I actually lament silently for the ephemerality of everyday things and then shake it off to focus on the dance I’ll later attempt to capture and hold with words. It all leads to the familiar strains of Leonard Cohen’s “Hallelujah,” plucked pensively through the four strings of a ukulele. The dancers’ interactions grow more supportive and intimate. It is only later that I recognize this as a subtle pivot point before Horn brings the sunshine. evening — ends as quickly as it begins. I still don’t know how exactly Horn makes the leap from “Hallelujah” to “Pineapple Princess,” she just does. Then again, I’m not sure how we make this leap in life either. We meditate or pray, we carry light through dark spaces, we reach out to connect during extended times of grey, or we just turn on the joy and choose to dance in full color. We camp out with one another under a homemade canopy of gold and rainbows. 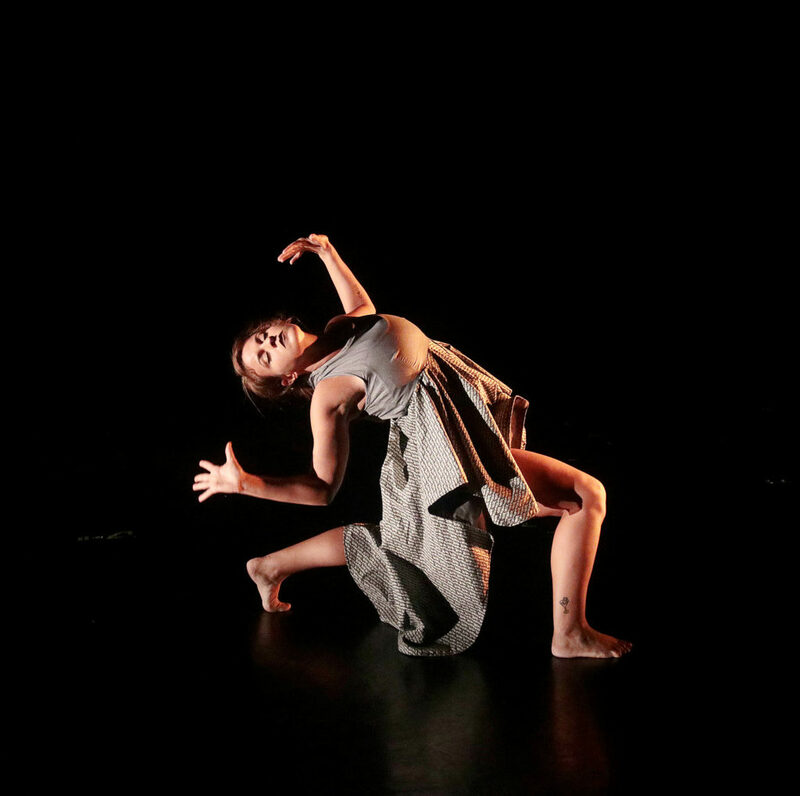 The Houston Fringe Festival, a program by The Pilot Dance Project and housed at the Midtown Art & Theater Center Houston (MATCH), draws to a close this Sunday, Sept 16, with the final performance of “The Sky Was Wild with Sunshine” at 6 p.m., and Anything Goes Weekend Two, a mixed-bill performance featuring Houston’s artists on the fringe, at 8 p.m.